Prior to 2016, it’s fair to say that if anyone knew about Stockade it was probably though an association with the contract brewing done out of their BrewPack home in MacArthur Grange, or perhaps for the seldom seen MacArthur label with which they’d had some success at competitions. In 2016, that all changed with the major unveiling of the Stockade brand, pushed first by way of a set of four reasonably safe core beers but boosted by a range of colourful limited releases that was often surprising and wildly esoteric – if you'd have said the brewery responsible for a many of Australia’s contract brewed golden and pale ales would be making waves in beer geek circles with beers like a chilli mocha white stout and peach gose, you’d have had your sanity tested. But this new outlook is how we end up with Old Money. This is a beer that began life a couple of years ago as a batch of Russian imperial stout called Rebellion. That beer flew almost completely under the radar in Australia but evidently had more success overseas, picking up the title of ‘World’s Best Imperial Stout’ at the UK-based World Beer Awards in 2015. Where that’s relevant for our story is that Old Money is the very same beer, with the important distinction that this version sat in the corner of the brewery for more than two years inside Lark Distillery whisky barrels and, by the time it was siphoned off and bottled, just prior to Christmas 2016, it had become a monster. 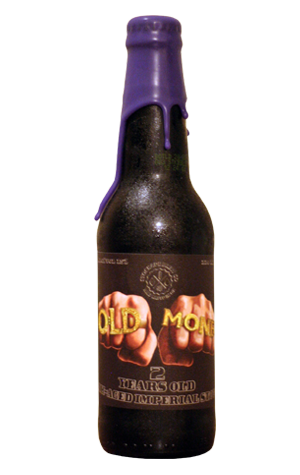 At 15 percent ABV, Old Money is one of the most potent beers to have been released domestically in recent times; the original RIS recipe came in at an already hearty 12 percent ABV and time has further concentrated things in the excise collector’s favour. It duly delivers everything you might reasonably expect a beer of such stature ought to, beginning when the boozy, whisky notes tickle your nostrils before you've even had a sip. On the palate it is incredibly rich, as if someone has soaked a load of dried fruit in whisky, used that to bake a moist and decadent Christmas cake, pureed and filtered it, then bottled the concentrate. It is replete with raisin and currant sweetness to the verge of fortification while oak, alcohol and slightly medicinal phenolic characters build layer upon layer as you sip away. And this most definitely is a sipping beer, one that will provide ample reward for those who enjoy their beers big, bold and barrel aged – something to end the night with. It’s also rare: there was only enough liquid for 700 bottles and all of those available at the brewery were snapped up on the first day of release so you’ll need to make a beeline for your local beer specialist if you want a chance at taking home the most surprising beer from one of the most surprising local breweries of 2016.